Ok, complete image bonanza ahead - unless your interested in the eternal questions like How do you fit three kids into one room? you should completely ignore this. 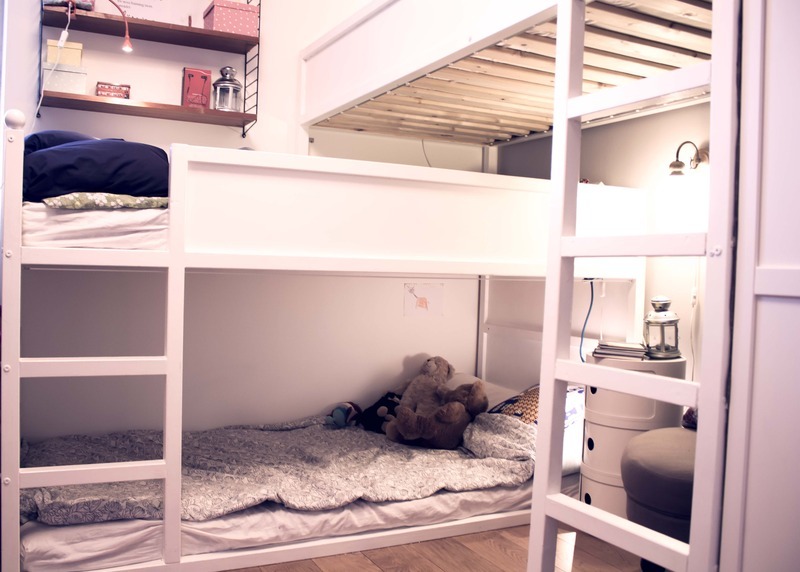 I get loads of really sweet feedback and questions on how we fixed the kids room so that it would sleep three kids and still have space to play, read, do homework or or just exist. Since I actually cleaned the flat AND had some sunlight, I thought I'd take a few pictures. Who knows, maybe they can inspire someone else to live a bit longer in a smaller place? Milos corner, at the bottom of the bunk bed. His mattress is currently placed right on the floor, it's on our to-do list to get a proper slatted bed base for him as well. You know, we'll get to it eventually... it's a Someday-project. 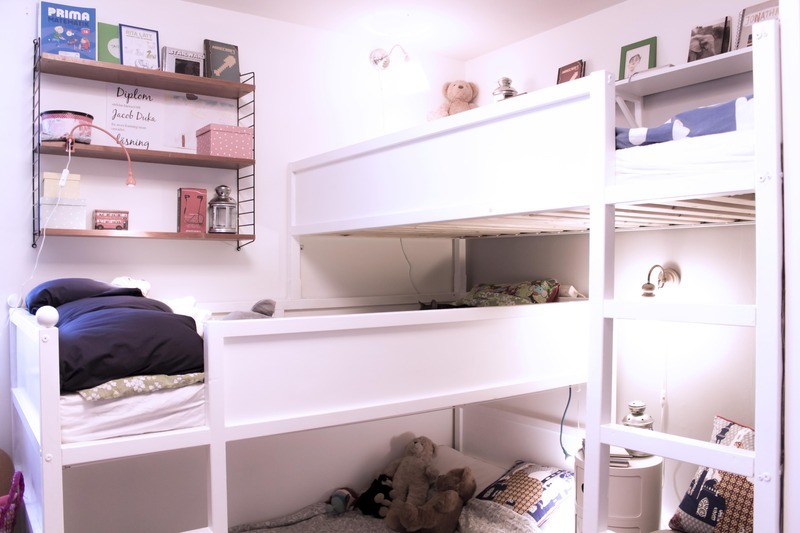 The triple bunk bed is made of two IKEA Kura beds, one of which has had one half of its legs cut of, and the other half replaced with longer ones. We also added a few steps on the ladder, then painted the whole thing white. 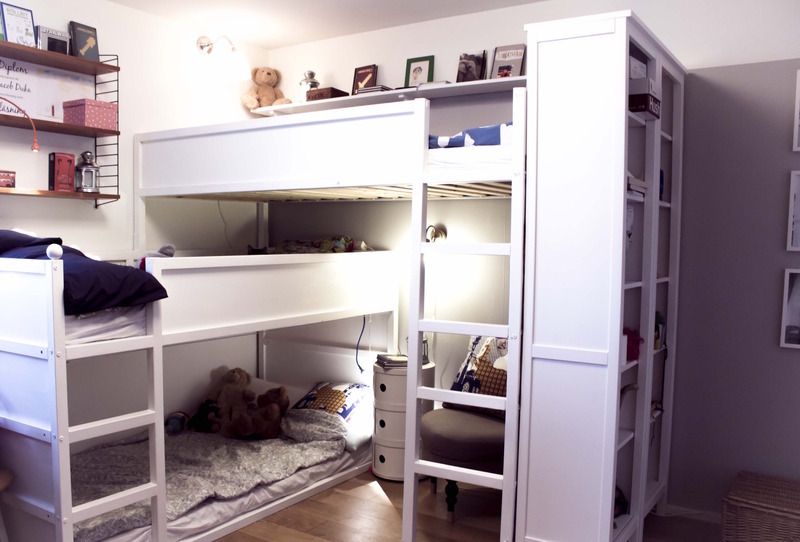 Jonathan, on the top bed, has one long shelf, and then some extra storage on top of the shelves, which are secured against the bottom part of his bed. Jacob has a String shelf for personal storage, one filled with little boxes as he loves collecting things. 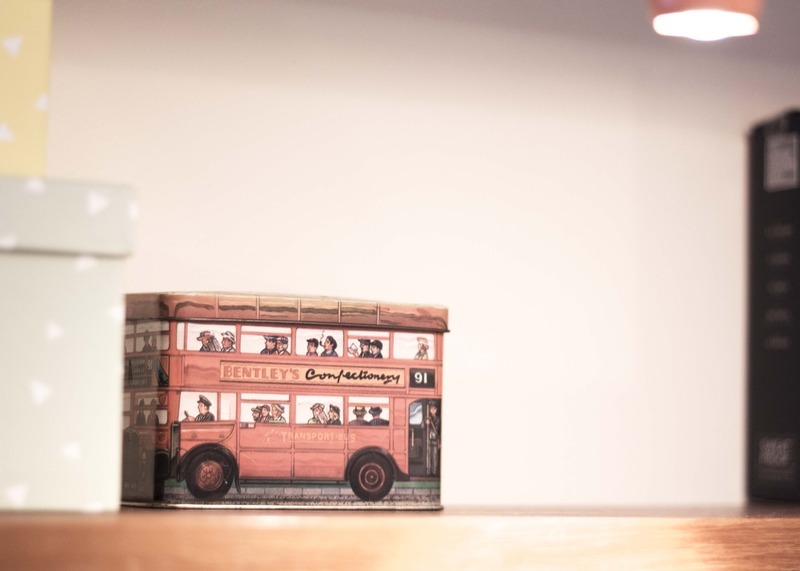 This little box I bought the first time I went to London, about twenty three years ago, and it was filled with sweets at the time. Jacob was wonderfully pleased when I gave it to him - so much so that he will now keep it just as it is, as a decoration rather than for actual storage. Each of the boys has a teddy from Build A Bear, with my voice that tells them I love them very much (it's a bit of a cringe, but that's ok, sometimes). 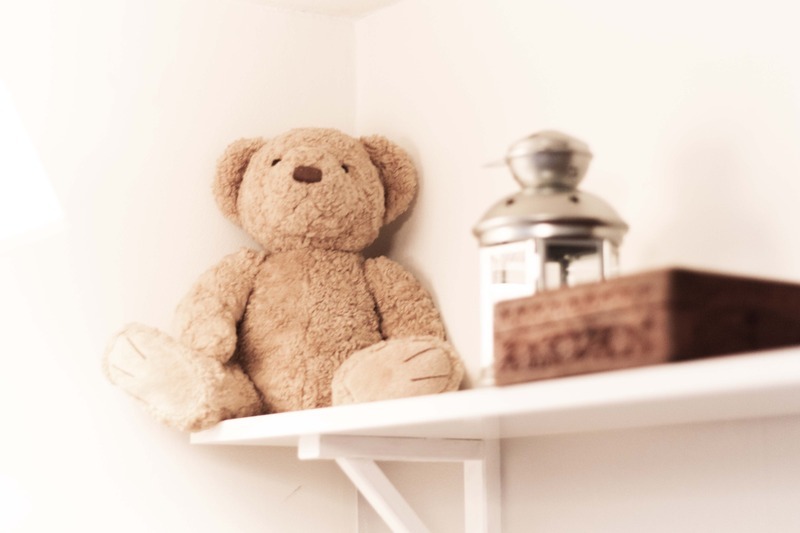 Though Jonathan thinks himself too old to actually have his teddy in bed, and instead keeps it on his shelf. 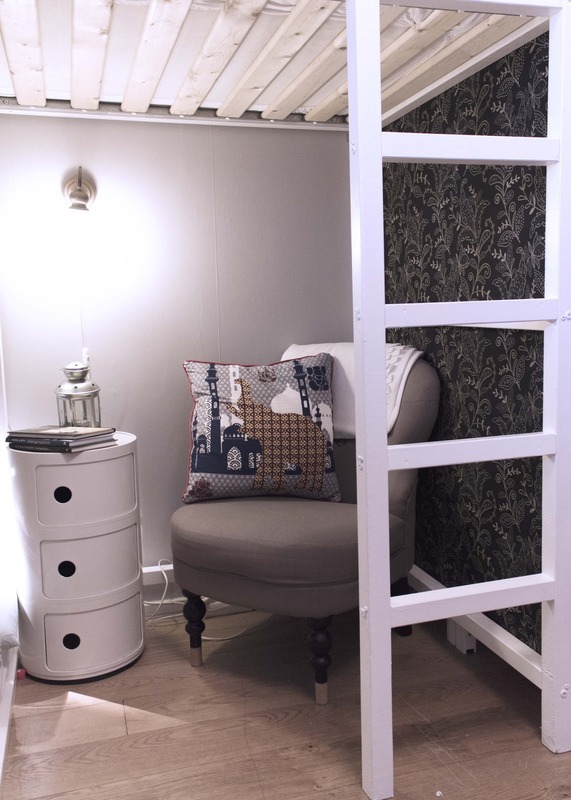 The reading nook next to Milos bed, where I will read bedtime stories and listen for the sound of them sleeping. The black wall is a piece of fabric I've stretched over the back of the two IKEA Hemnes shelves that are attached to the bed. Once or twice I've caught one of the boys curled up in the armchair with a book, so I will consider it a success. Now, if I only get around to cleaning their desk and shelves on the other side of the room, I can show some pictures of that as well. Oh well, another time.